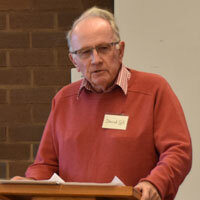 The Revd David Gill, ordained in 1965, served on the staff of the Australian Student Christian Movement and the World Council of Churches. On the 14th of May 2018 he gave an address to the Ecumenical Roundtable held at the Australian Centre for Christianity and Culture to mark the 70th anniversary of the World Council of Churches. His address can be downloaded from the Publications tab on the Centre's website or directly via this link.